The arrival of Jonty Rhodes in India has highlighted an area of the game that is generally ignored - Fielding. He has named his best contemporary 'Fielding' team. It's indeed a wonderful 'side' that he has 'picked', but he has ignored some extremely able and competent close-in fielders, who really are the ones who do immeasurable service without getting the praise and compliments that a fleet-footed 'outfielder' receives. 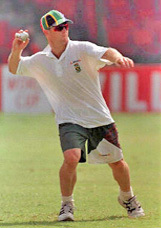 Jonty was an exceptionally good fielder no doubt, but was he as good at forward short-leg or silly point? Going by the poor performance of Yuvraj, Gambhir and Kaif at these positions (although the last-named has demonstrated the capability but lacks the requisite technique to field at the 'suicidal' short-leg position), it is not just agility and quickness that are required, but concentration, guts and also that uncanny ability called the sixth sense. It is this ability that distinguishes a good close-in fielder from a great one. When one is young, one tends to be fearless. Standing at the suicidal position is a great challenge and even source of fun. One can stand day in and day out at positions that could be fatal, in club, office or even some irrelevant matches. Never would the thought of being maimed or killed occur. The brashness of youth!! I did go through this phase. It was after taking a few solid hits on the head and body that I felt I needed protection, and my first option was to wear a scooter helmet. I went to Roplas, the helmet manufacturers, and they were extremely helpful in making a helmet for me. Of course, those were early days in the evolution of the cricket helmet, and the piece I wore was completely different from the specialized 'light' helmets that are presently in vogue. I tried it this headgear in some Times of India Shield games and the experiment turned out to be a disaster. It restricted head movement and caused a terrible ache at the end of the day. The helmet also attracted severe criticism from journalists, who felt that if a fielder standing close to the bat did not have the guts to take a rap on his head, he did not deserve to be there. The famous writer Behram Contractor in his popular 'Round and About' column that he wrote under the pseudonym 'Busybee' actually wrote a funny piece on it, about how he gave me a lift on his scooter and how I demonstrated the versatility of the helmet, ideal as it was to wear while riding a two-wheeler and also while playing cricket! Years later, we met at a gathering shortly after my dear friend Raman Lamba was killed fielding at short-leg (without a helmet), and the very next day, Behram wrote a piece criticizing his own article written many years previously. It was a terrific gesture from one of our best writers. Today, the close-in fielders resemble Roman soldiers in the 'armour' that they don while fielding, from the helmet to various other hidden padding. These protective pieces might well have restricted their movement slightly. However, the value of life is far more than a reckless piece of heroism. Incidentally, Jonty picked only ten players in his 'Fielding' team. I am sure that had he seen someone like Eknath Solkar, who was brilliant in each and every part of the field, he would have made him the captain of his 'Fielding XI'. I do feel that not a single member of his 'Fielding' squad would have stood at short-leg and clasped some unbelievable reflex catches off dangerous hitters like Clive Lloyd, Gary Sobers and Viv Richards.